Carbenes Generated within Cyclodextrins and Zeolites (U.H. Brinker, M.G. Rosenberg). Mechanistic Studies on Enzyme-Catalyzed Phosphoryl Transfer (A. Hengge). Finite Assemblies in the Organic Solid State: Towards Engineering Properties of Solids (T.D. Hamilton, L.R. MacGillivray). The Physical Organic Chemistry of Very High-Spin Polyradicals (A. Rajca). Computer Simulation of Enzyme Catalysis and its Relationship to Physical Organic Chemistry (A. Warshel et al.). Mechanisms of Hydrolysis and Rearrangements of Arene Epoxides (D. Whelan). Advances in Physical Organic Chemistry provides the chemical community with authoritative and critical assessments of the many aspects of physical organic chemistry. The field is a rapidly developing one, with results and methodologies finding applications from biology to solid state physics. 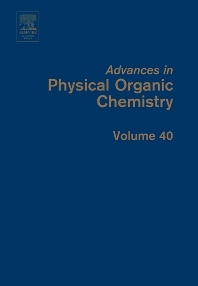 This text is ideal for those interested in the relationship between the structure and function of organic compounds, including physical and theoretical chemists as well as organic and bioorganic chemists.